Express admiration for her beauty and spirit with a striking tribute certain to evoke many cherished remembrances. 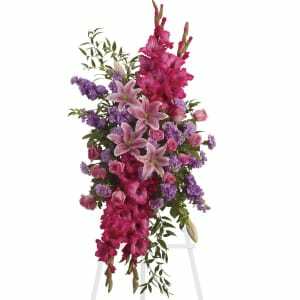 • Gorgeous flowers such as pink roses, oriental lilies and gladioli blend with purple stock, lavender carnations and fragrant greens. 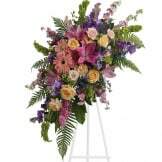 • This arrangement measures approximately 22" W X 56" H.
Flowers will be received by a Stonacek Funeral Chapel's staff. These flowers were commented on by everyone who saw them. People were amazed at how beautiful they were. They really stood out. If you REALLY want to make an impact, order the premium version. We were so happy with the flowers for moms funeral. Thank u for making a difficult time easier. The colors in this arrangement were gorgeous. 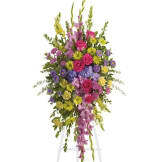 It was a very large arrangement that made a stunning display. I was very please with the arrangement and the service of The Sympathy Store. Online ordering was easy and the flowers were delivered as promised. All of our flowers are designed and delivered by hand from a local florist in in Norfolk.